Govt Job Online Latest Recruitment Notifications 2019-2020 -Latest Government Jobs Exam Syllabus: Gandhi Polytechnic College, Erode Notification 2019 Lecturer Jobs. 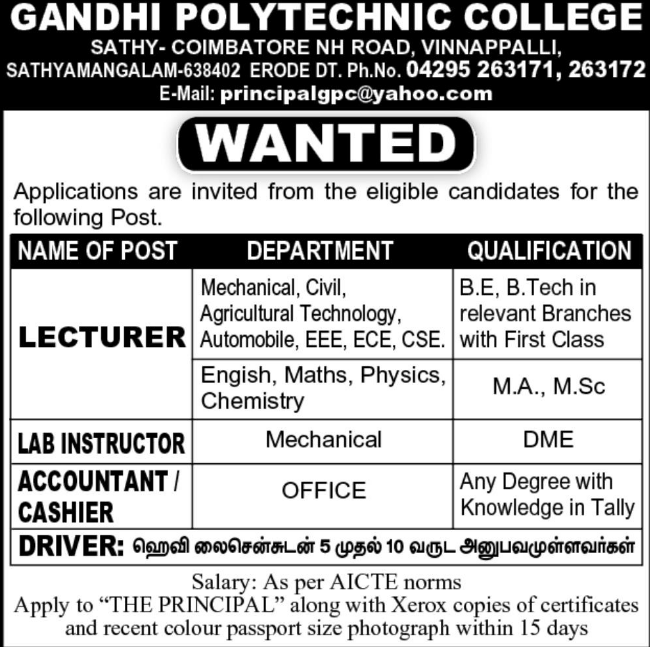 Gandhi Polytechnic College, Erode Notification 2019 Lecturer Jobs,Gandhi Polytechnic College Jobs Recruitment 2019 For Lecturer,Lecturer Job In Gandhi Polytechnic College. Home Erode Etode GPC Lecturer Jobs faculty jobs Gandhi Polytechnic College Gandhi Polytechnic College Jobs Gandhi Polytechnic College Lecturer Jobs GPC Lecturer Jobs Lecturer Jobs Tamil Nadu Gandhi Polytechnic College, Erode Notification 2019 Lecturer Jobs. 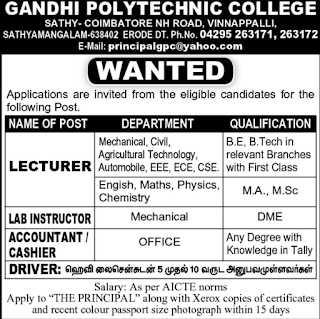 Gandhi Polytechnic College, Erode Notification 2019 Lecturer Jobs. Gandhi Polytechnic College Jobs Recruitment 2019 For Lecturer. photo graph to college address given below. For these jobs can apply within 15 days from the notification date. Further details can refer the official website http://www.gandhiinstitutions.org/ for Gandhi Polytechnic College Lecturer jobs. Required Details like Salary, Important dates, selection Process, Qualification are given below. Lecturer Job In Gandhi Polytechnic College. Important Dates for Gandhi Polytechnic College. Available Vacancies for Gandhi Polytechnic College. For Lecturer: B.E /B.Tech in Relevant branches with first class. For Accountant/Cashier: Any Degree with Knowledge in tally.